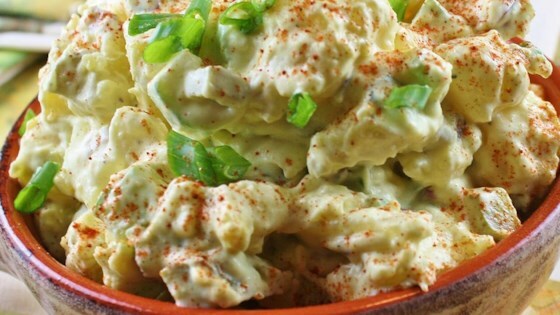 "Quick and easy potato salad recipe with a lot of old-fashioned potato salad flavor. This will become a go-to summer side dish recipe. Better if made the day before." Place potatoes into a large pot and cover with salted water; bring to a boil. Reduce heat to medium-low and simmer until tender, about 10 minutes. Drain. Return potatoes to empty pot to dry while you mix the dressing. Sprinkle with salt. Stir mayonnaise, pickles, hard-cooked eggs, red onion, celery, mustard, cider vinegar, 1 teaspoon salt, and pepper together in a large bowl. Fold potatoes into the mayonnaise mixture. Allow to chill at least six hours, or overnight, before serving. Watch how to make this creamy potato salad. Absolutely delicious! I sprinkled a little paprika on the top before serving! Made this for something to go with hamburgers. It was excellent. There were only four of us so I adjusted the recipe. Everybody loved it. Will defiantly make again.